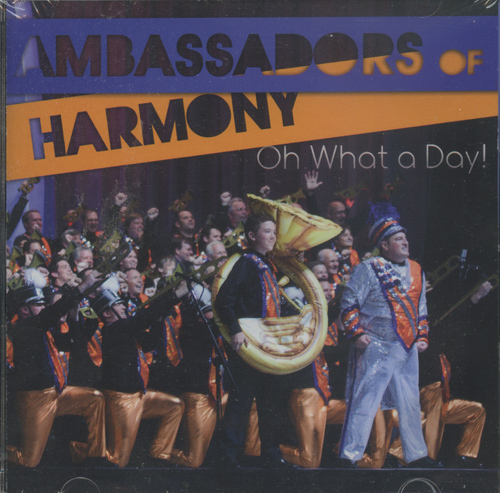 Ambassadors of Harmony: Oh What A Day! Founded way back in 1963 in St. Charles, MO, The 160-strong Ambassadors of Harmony are one of the best, most entertaining men's Barbershop choruses in the world, and they have the Gold necklaces to prove it: SPEBSQSA (Barbershop Harmony Society) Gold in 2004 and 2009! We can tell by their costumes, expressions and wonderful music that (1) these gentlemen are having big fun up there on stage in international competition, and (2) they can sing their collective tails off! We think we can call "Oh What a Day" a best-of collection, mainly because it includes "Seventy-Six Trombones," the Merideth Willson tune which led off their Gold-winning set in July, 2009, but also because every one of these cuts is a stone winner. "America," the sassy Stephen Sondheim/Leonard Bernstein hit from "West Side Story," "Friend Like Me," Howard Ashman/Alan Menken's song from "Aladdin," a cover of the traditional Scottish Air "Loch Lomond" that could break your heart, the wonderfully dramatic theme song from "Man of La Mancha," Ira and George Gershwin's sweet "Love Walked In," the Spanky and Our Gang hit "Lazy Day," Brian Wilson's "God Only Knows," Merle Kilgore/June Carter's Johnny Cash hit "Ring of Fire," and the Edith Piaf hit "If You Love Me, Really Love Me (Hymne a L'Amour)"-these are some of our favorite songs of all time, and the A of H nail every one of them. That's entertainment!